Ain't that just like D. Wade? As one of the NBA’s most stylish players, Dwyane Wade is known for his edgy — and sometimes, rather … interesting — fashion. 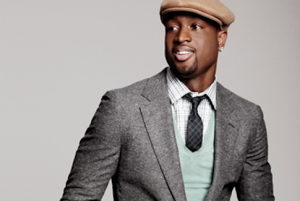 “The Gentleman by Dwyane Wade” collection, which will be a collaboration of Mr. Wade’s personal design team and the Tie Bar designers, will include about 30 bow ties, 15 neckties, 15 pocket squares, tie bars and cufflinks. The new line will be available online only at TheTieBar.com starting in November, with revenue split between the NBA star and the company. The line will be released for sale online in November.